I was a child of the fifties and sixties, which was an uncomfortable time to be a young fellow like me in our country. I always knew I was different. Not many boys in my all male private school were into opera and ballet, though a couple did become classical musicians. But I survived and even thrived, through a combination of good luck in my family and friends, and living in a place where being different was not so much of a sin. I was fortunate enough to live in New York, the most exciting city in the world, and I had a mother who didn't care what my life preferences were. Since she, too, loved the opera, as did my delightful Auntie Lush, I attended many a weekend matinee at the opera, orchestra and ballet. So for obvious reasons, mostly because I was a fairly creative lad, I didn't go for the usual in my choices of Hallowe'en costume. I am lucky enough to have an older sister who has always loved to sew when we were kids. She went on to become an award winning creator of costumes for opera and Broadway. She now lives in Italy, but is planning to retire and come back to the US. Anyway, while most of my friends were Roy or Buck Rogers, I was always something completely different. When I was 10, I was The Wolf Man from the Lon Chaney 1941 movie of the same name. 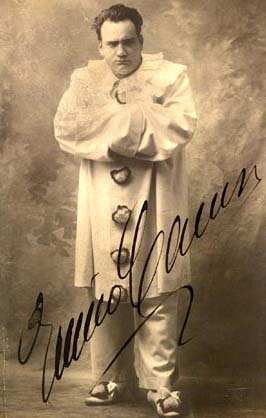 Another year I was Enrico Caruso as Canio, from Pagliacci. Everyone just thought I was a rather odd, sad, disheveled clown. 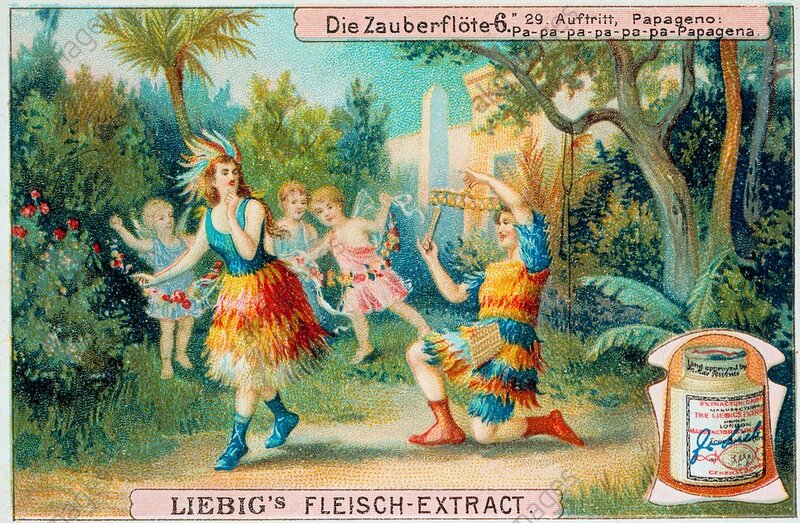 One memorable year in the late 80s my sister and I went to a party as Papagena and Papageno from Die Zauberflote. Everyone just thought we were Macaws, or a Jimmy Buffet tribute. Which was all right. So tell me, dear friends... what was your most memorable costume? (Or one you created for your children or grandchildren, or whomever!) Tell me, do! 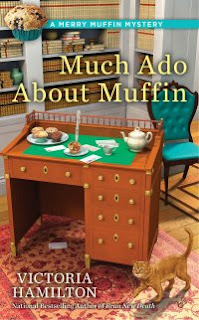 Comment here to enter to win one of TWO copies of Much Ado About Muffin! 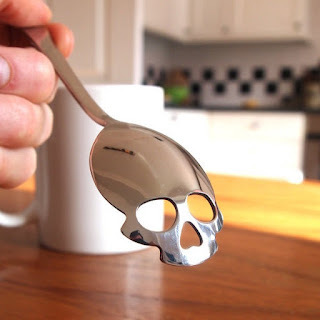 AND... each book will come with a COOL skull teaspoon! Canadian and US addresses only, and please leave an email in your comment. You can leave it like yourname (at) yourserver (dot) com if you wish, along with your first name! Entries will be accepted until Midnight, Saturday October 22nd! Meet Victoria on Social Media! My favorite one I made was for one of my daughters. She was the Pink panther. The favourite costume of my son's was Gandalf from Lord of the Rings. His father made it and I didn't recognize him! When my daughter was in Girl Scouts I made a Wednesday Addams costume for her. I made a dress out of burlap, and a doll with no head. My daughter braided her hair and did not smile the whole evening, just like Wednesday. My daughter was princess peach from the Mario games. She decided that wasn't exciting enough, so she had me turn her into zombie princess peach. It was very unique. My most memorable costume was as a hobo at a skating costume contest. The one I've really remembered from a parade was a really cute pink Hershey's kiss. I really like original costumes... They can be so cool to see the imaginations! One year I made a ghost costume like Charlie Brown wore on It's the Great Pumpkin Charlie Brown. The one with all of the holes in it. I took a sheet and a permanent marker. And I drew and colored in circles. Then I cut out holes for the eyes, and attached the sheet to the hat. I loved that costume. Thank you so much for the chance to win!!! I would love to read the book, and that spoon is amazing!!! We didn't trick or treat very often as we lived in the country. Had a poodle skirt and saddle shoes one year. 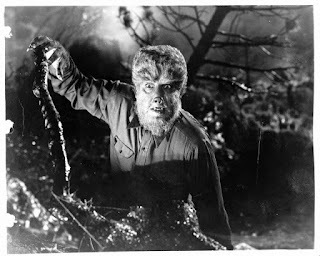 I grew up in the fifties and sixties, too, and would have loved to be The Wolfman or any other Creature Feature character for Halloween. Probably my most memorable costume was the one my mother made one year: Carmen Miranda, complete with fruit bowl on my head! I am sure no one would have a clue about who that is anymore. Love the series and thanks for the great giveaway. We didn't dress up for halloween much. I do remember dressing up as a hobo. I have seen pictures of myself when I was 5 wearing a skeleton costume with jacko-lantern bag! This series is new to me but I love the title of the book. Thanks for the opportunity to be introduced to new stories. mlarkin (at) rmrgroup (dot) com. I really don't remember dressing up as anything really interesting, just the usual witch or ghost. Costumes weren't a really big deal like they are now. Would love to read "Muffin Ado About Muffin". Really love the spoon, it so different. Thanks for the chance. I made my youngest son a Teenage Mutant Ninja Turtle back when they were first popular. I sewed the complete outfit including the 4 inch thick shell. My poor sewing machine. I've also sewed some pretty cool ones for my grandchildren like real looking witches, scarecrows, devils. I miss doing that. I have 2 favorite costumes: Snow White & The Tin Man. Thanks for the chance. My most memorable costume was a witch costume that my mother made. She dyed a white sheet and it came out dark gray. She also painted my face green and I had a gray wig. At the time I didn't consider my mother's time and effort in making my costume. I can now remember her sitting at the sewing machine making that outfit for me. Thanks for the chance to be entered in this great giveaway! It was a very cold October. So I bought a black mens sweatshirt that was down to my sons knees. I made satin legs like a spider and sewed them on the sweatshirt. The sweatshirt was able to go over his coat so he was warm. He wore black sweatpants and I made a matching spider hat with eyes and little legs. He was cute and warm, and was 6 years old. He is now 32. When I was a child, we just wore the dime store costumes which were noting spectacular. I've only dressed up for Halloween one time as an adult. I wore a white Karate uniform. Thanks for the chance to win! My husband and I went to a Halloween party as a Hitchcock Double Feature. He was The Birds with black birds all over him, even ripping through his shirt. One eye was blacked out and the bird on his head had an eye ball in its beak. I was Psycho, wrapped in a shower curtain with blood red hand prints dripping down the inside. we dressed up at work and I wore my husband's camouflage he uses for hunting ..topped off with face paint and toy ruffle and stuffed deer sewed across my shoulders..lol was hilarious..
One of my favorite costumes I wore to a contest in College was "lava rising" and wore layer upon layer of an old hula string skirt in red all the way up to my head. I had to part the strings to eat. It was memorable. I absolutely love the spoon and would like to read the book. Thanks for the chance. I was in a play in grammar school & in the play I had to wear a long gown like a Pilgrims costume so I wore that for Halloween. I've also been a witch, hobo & a Princess. I really don't dress up for Halloween, but I love to see the different costume that people come up with. Thanks for the chance. My favorite costume ever was one my mom made when I was a kid. It was a black cat costume. She did such a good job on that costume! and we don't go to the trouble. Would love to read the book. thanks. Nothing stands out as we had the costumes with face masks from the 5 & dime store. Those masks had a terrible smell that I can still remember 70+ years later! I've had some fun ones for my 8 children but my favorites were for the oldest 3 (passed down to the younger ones). They were orange & green dinosaur/dragon costumes complete with paws & foot covers! I had some quirky favorites growing up in the fifties and sixties...watching old British horror films with Christopher Lee, Peter Cushing. At Halloween I tried my best at a wicked witch costume. The makeup was perfect, my costume was black, my hat pointed, and even the little wart on my nose. I'll be dressing as Penelope Garcia from Criminal Minds. I tried to dress up as Tina Tunner . Lol. I have 6 children and 3 grandchildren so we've had lots of cute costumes over the years. My favorite was a Dorothy costume from The Wizard of Oz. I think my most memorable costume would have to be the bunny suit that I wore as a child. My mom made it and my sister wore it as well. Between my sister and I we have 3 children and they have all had a turn wearing it. The best part about it is we all wore it for easters too. Thanks for the fun. Love reading about everyone's costumes! One year I dress up as Tina Tunner. My son as a mummy-he was just so cute! Yes, I also grew up in the 50s and 60s and store bought costumes were almost unheard od. One Halloween, several years later, when I was a youth leader at church, I made a costume out of a piece of tan material and edged it with off white fringe. I added a life size baby doll to a homemade carrier, put it on my back, added a headband with a feather and I was an Indian maiden with her papoose. Maybe the kids felt sorry for me but I actually won a prize!! I dressed up one year as a pirate gal. My most memorable Halloween was the year I got to where a clown costume my mom had made. My older sister and brother had already worn it and I was so excited that I had finally grown enough to be able to wear it. best Halloween ever!